We understand that life gets busy sometimes and that it is hard to carve our time in your schedule to come to the dentist, let alone trying to find the time to come in twice if you need to have a crown done. In most cases, when a patient needs a crown done, they come in for their first appointment, get numb, and then the doctor would reduce the tooth to prepare for the crown placement. The next step would be to take an impression with the highly invasive impression tray filled with impression material. Once the impression is taken, the doctor would the make a temporary crown out of a thin resin material and cement it with temporary cement. Because temporary cement is used, the temporary crowns usually aren't that sturdy and have been known to come off in the two weeks that the patient has to wait for the lab to fabricate their crown. So the visits to the dentist could add up to three or four using conventional methods. All of these inconveniences are solved using the CEREC system. With CEREC, the patient comes in, gets numb, Dr. Core prepares the tooth for the crown, he then uses a special camera to take images of the tooth and the surrounding area. 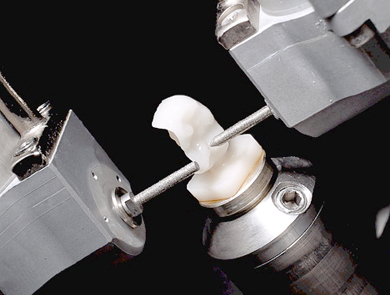 The CEREC system takes those photos and sends them to a CAD/CAM milling machine. The milling machine then mills the crown out of a single block of porcelain, as seen above. The whole process is fascinating to watch, which Dr. Core is more than happy to let you do if you are interested. A CEREC crown isn't just convenient, it is also healthy. Many years ago, dentists had few options to repair decayed and damaged teeth other than amalgam, gold, and other metals. With CEREC, Dr. Core can use strong, tooth colored ceramic materials to restore your teeth to their natural strength, beauty, and function. Also, the materials are chemically bonded to your tooth, so Dr. Core can save as much healthy tooth tissue as possible while providing your with a crown that strengthens your tooth.